For those without comedic tastes, the self-proclaimed experts at Wikipedia have an article very remotely related to LazyTown. This is what the words look like when they're on the TV and on anything that is a proper LazyTown thing so don't buy it unless it has this on it. Hi my name's Joshy and I’m four and I’m gonna tell you all about LazyTown – it’s my favourite TV programme and Daddy says that if I watch it anymore I’ll know all the words - but I already do and that means I could be an actor when I’m big and that’d be really, really cool because then I’ll be on the TV and my best friend Thomas will be really jealous because he's a rubbish actor! I like LazyTown because it tells me that if I eat too many sweets I’ll die, even though Mummy says I won’t - but she’s stupid because she’s not Sportacus and she works in a bakery that sells cakes - which aren’t good for you either. And LazyTown also has adventures in it too where Robbie Rotten tries to make LazyTown lazy again and then Sportacus has to stop him otherwise everyone in LazyTown will die of fatness and if that happened then there will be no more LazyTown to watch and I’ll be sad because I might have to go fishing with Thomas’ daddy and it’s really boring. LazyTown has lots of characters in it but it’s OK because I can remember them all because I have a really good memory – except Mummy calls it “selective” because I sometimes forget to go to the toilet when I’m watching LazyTown and I wee on the carpet and then she thinks I wanted to mess it up on purpose - but I didn’t – even though this one is horrible and has flowers on it – I wanted one with a road on it like Thomas has – he gets everything he wants and that’s not fair! Stephanie is a lot like me – but I'm not a girl and I don't have pink hair and I don't like handbags either because they're stupid and I have pockets! 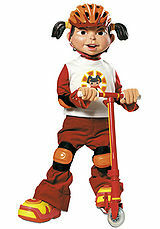 Stephanie is the main character and in the first episode she moves to LazyTown and has to make friends which was kinda like me when I had to go to nursery – except I’m not a girl – they smell – and she makes friends with Ziggy and this is always repeated at the start of the programme because there might be some children who missed the first episode and that helps them catch-up but it’s stupid because I think they should just have to watch the first episode because it’s good. Anyway Stephanie has pink hair which is silly because I’ve only seen one other person with pink hair and I’m not even sure if it was a boy or a girl and they had lots of metal in their face – it was ugly! Stephanie has to live with her Uncle – and he’s the mayor – because she is only staying in LazyTown for a holiday. I asked Daddy if I had an Uncle because I couldn’t remember and he said I had too many and so I asked him if he was going to kill some and he laughed and said he felt like it sometimes but no because killing is wrong. And then I asked him if any of my uncles lived In LazyTown but he said no, and that LazyTown isn’t real - but I was just making a joke. 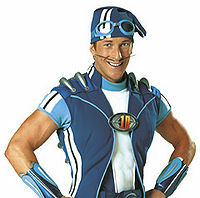 Sportacus looks like Daddy which is cool becuase there was one time I told Thomas that Daddy was Sportacus and Thomas believed me because he's stupid! Sportacus is my favourite superhero ever – except for Spiderman because he’s really, really smart and takes pictures – I want to be like Spiderman when I’m older! But Sportacus is really cool too because he does gymnastics and nobody makes fun of him for it because other wise he’d beat them up! And Sportacus calls himself a “slightly above average hero” which is funny because Daddy says that that is “very modest” of him but I think it is boasting a little bit – but it’s actually OK to boast when you save people from dying of fatness and Daddy said that I’d like Jamie Oliver – except I don’t know who he is – but if he stops children dying of fatness too then I think he probably is an above average hero like Sportacus. Sportacus lives in a big blimp which he flies down to LazyTown when he knows that there is somebody there in trouble and then he rescues them with his ladder or sometimes he jumps out and does gymnastics on the bad guy – who always turns out to be Robbie Rotten which is always a surprise. I asked Mummy if I could go to gymnastics but when she took me to it one time there were only girls there and they tried to make me wear girl’s clothes and so I didn’t go again - now I just practice Gymnastics on Thomas. Ziggy isn’t a real person he’s a puppet which is funny because nobody in the programme notices he’s a puppet and that means they’re stupid – but it’s ok anyway because he’s a nice puppet and Daddy said he reminded him of me which makes me think he forgot me and that’s not good because he might leave me in the Tesco car park again by an accident. Ziggy still eats lots of sweets even though the others tell him he shouldn’t and that’s like Thomas not me because Thomas is stupid and Mrs Peterson from nursery says I’m a really smart boy and she gives me lots of gold stars – which means I’m really good at nursery things. I don’t like stingy because he's really selfish and never shares any of his toys - which is like Thomas except he always says that I’m going to break his toys but I don’t always – in fact I only did it once and that was because the controller wasn’t working for me anyway so it didn’t matter if his Wii got smashed. Stingy also always asks for stuff because what he has is never enough and this is stupid because he lives in a giant mansion with lots and lots of stuff – most of which I want but he can’t give it to me because he isn’t real. Stingy also has a car and I want a car too but Mummy says I’m not old enough and when I asked Daddy he said that I’d be way too dangerous “behind the wheel” and even when I promised that I’d be careful not to run over anybody he still wouldn’t buy me a car – adults are so nasty sometimes! If I had a little sister she would look like Trixie because all girls are ugly. Trixie is another girl and like all girls she’s really bossy and she’s always playing mean tricks on people – like in this one episode when Stephanie and Stingy and Ziggy are camping she pretends to be a ghost and scares them and that spoils their camping trip – which wasn’t nice. Once me and Thomas were camping in his living room and his daddy fell onto the tent because he was drunk and then he pretended to be a ghost which wasn’t scary because he was drunk and fell over again. Trixie would smell horrible if I could smell her because she’s a girl but it’s ok for now because you can’t smell things though the TV – which means that sometimes cookery programmes are boasting that they can smell the food and you can’t which isn’t nice. Pixel is really good with computers and so his name is something that Daddy called a pun and Daddy thought this was funny but it’s not because Daddy can’t work computers and I had to show him because of what I learned from Pixel – except Mummy got really mad when I made her e-mails disappear by an accident and made naked ladies come up on it and they didn't have wee-wee's and daddy said he liked it so mummy shouted at him. Robbie Rotten is a bit of turd – Daddy said that and then he told me never to repeat it in front of Mummy or she’d kill him but I haven’t because I love Daddy more than Mummy and I don’t want her to kill him – and anyway Robbie Rotten is always lying to people because he always dresses up and says he’s someone different and then he tries to trick the children into dying of fatness. Daddy said that he supposes this would be called manslaughter before long and so this makes Robbie Rotten an attempted Manslaughterer. But there are sometimes when I feel sad for Robbie Rotten because he has no friends and he lives underground and so he doesn’t have a garden to play in. I play in my garden and I dig holes that Mummy falls into when she’s putting the wet clothes on the washing line. So maybe Robbie Rotten isn’t all bad but you have to watch out otherwise he might make you eat sweets and then die of fatness. I think that’s all the main characters in LazyTown – there is also the Mayor and Mrs Busybody but they aren’t important characters because they’re useless and don’t know how to protect the children - Sportacus does that instead so I don’t want to talk about them now. 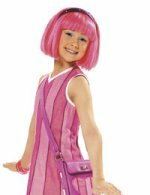 I Have Lot's of Really Cool LazyTown Stuff! 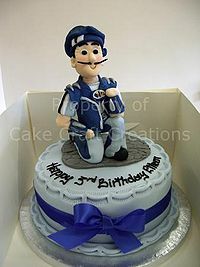 Mummy made me This LazyTown cake for my birthday one time but I didn't want to die of fatness on my birthday and that Sportacus didn't look like Daddy so it was stupid. I have lots and lots of really cool LazyTown things - like my LazyTown bed which I sleep in – it has the words LazyTown on it and Sportacus and Stephanie are dancing which is cool although sometimes it isn’t my LazyTown bed and Mummy makes it into a Power Rangers bed and I don’t sleep in that one because it’s stupid and I don’t like the blue one because she's a girl. I used to have all the LazyTown action figures and I’d use them to make up my own adventures – where Spiderman and Sportacus both have to stop Robbie Rotten from launching a fatness missile on LazyTown that would kill everyone! But then I didn’t have all of the action figures because Mummy stood on Robbie Rotten and he broke in half and she said this was because he was too thin - but I don’t think he was because I tried to break him once because Spiderman had to Kill him and it didn’t break then – I think Mummy wanted to break him to make me sad. I hate Mummy - but Daddy bought me a new one so it’s ok. I have both of the LazyTown CDs too and I listen to them when Mummy is driving me to Nursery but she usually switches them off before we get there and that isn’t fair because then she puts on her music which is stupid stuff about getting drunk and kissing disgusting girls and I don’t like it because I want to listen to my LazyTown – Mummy can listen to her stuff when I’m not there but she's selfish like Stingy and when I told her that she shouted at me! Sometimes the boys at Nursery bully me for watching LazyTown because they think it’s for babies but it’s not because Daddy said that my cousin who's in Big School still watches it and so it isn’t for babies and then daddy said that those boys can just go to Hell because they’re stupid and he also said I shouldn’t repeat that in front of Mummy and so I won’t because she doesn’t like LazyTown either and maybe she’ll start being mean like those boys and then she'd have to go to Hell too.